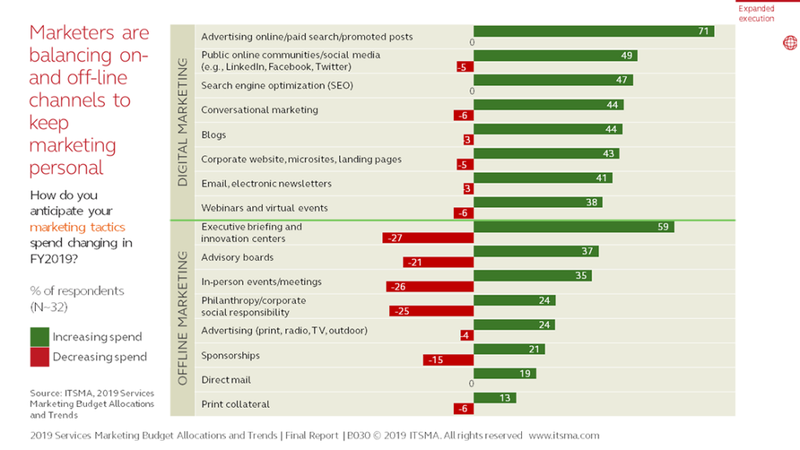 Not surprisingly, there is one area of the marketing budget that is flourishing in 2019: digital. A significant 63% of respondents in our latest Services Marketing Budget Allocations and Trends study (PDF) are increasing their digital marketing budgets for this financial year. Not one is planning any decreases. A lot of that online spending is earmarked for marketing technologies and tools, which will account for 41%, or the largest portion of the marketing operations budget. Offline is a different story, with 26% decreasing that part of the budget in contrast to the 18% increasing it. When it comes to online tactics, the biggest rise is in online advertising/paid search, followed by public online communities/social media and search engine optimization. However, in this era of relationship building, offline can’t be ignored. While you can personalize your interactions in digital marketing, it is no substitute for using face-to-face to encourage close relationships and trust. Indeed, face-to-face engagement is vital when buying high consideration, complex services and solutions. Note that 59% of marketing organizations are increasing their budgets for executive briefing and innovation centers that offer an ideal venue for intimate meetings. Companies are also investing in advisory boards and councils, as well as physical meetings and events. The conclusion? Use all the technology available to become more efficient and targeted. But don’t forget the importance of the personal touch. Marketers need to be smarter about how they manage this delicate balancing act. Learn more about the 2019 Budget Allocations and Trends study, how it examines marketers’ strategic priorities for 2019 and the changes in marketing budget growth and allocation.